Denys Fisher Stretch Incredible Hulk! The Stretch Incredible Hulk by Denys Fisher is without any doubt, the Holy Grail of all that is Stretch and Hulk.Keep in mind that there are only 19 confirmed Hulks in existence! ONLY 19! and only 12 are in great condition.These Hulks are Highly wanted by every stretch and Hulk Collector out there, This is the No. 1 Hulk and Stretch collectable there ever was and ever will be. If you dont have one now, you most likely never will.This amazing stretch was manufactured only in the Thorp Arch Estates in the United Kingdom by Denys Fisher and was Liscenced under Kenner. That means that they are unlike any other stretch figure in that they were not available in the United States and even now all 19 known Hulks originated from the UK and half the Hulks are still in the U.K. You may say,Stretch King? But the Japenese Monsters and Armstrongs were also only available in Japan where thay were produced, what makes the Hulk so special? One must realize that these figures were knock offs of the original kenner Monster and Armstrongs, some were the exact same figure sold in a Jap Box. They are not unique as is the Denys Hulk which was produced only in the UK as well as it being the only Hulk with no other versions produced in any other countries.The Denys Fisher Hulk was produced only in the UK as the figure that it is.It is said that the Hulk was produced In a Quantity of only 1,259. Each one of the Hulks were issued with a piece of tape sealing the top lid of the box that was thought to indicate what production number it is, however I recently discovered that this number tape is in fact only a catolog number as every Hulk has the same number on the tape.You can see more details of this on other pages of this site. Only 19 of these babies are known to exsist to date with the most recent number 19 Hulk showing up in June of 2008,Nine of the Hulks are in the United Kingdom.The other ten are now in the United States. All of these Hulks originated from the UK.Six of the ten U.S. Hulks are Mine. 16 of these remaining Hulks are still soft and clean, three are in need of repair. The green hulk was made with the exact same mold as the original Stretch Armstrong by Kenner and has the exact same box, packaging and graphic design as the Kenner release armstrong. 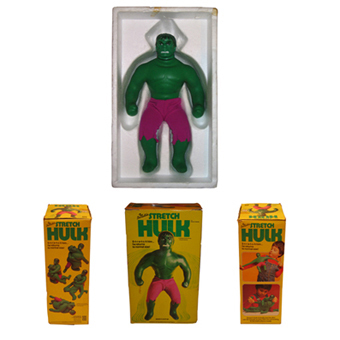 The Hulk is actually considered one of the first Original Kenner Stretch Figures that was only licensed by Kenner and produced only by Denys Fisher, which is why this figure is so valuable! It is Physically a Kenner Figure produced by Denys Fisher and was exclusive to the United Kingdom.This is why the Hulk should definitely be considered one of the first original Kenner 7 stretches, which I like to call the Alpha 7. Armstrong, Monster, Ollie Octopus, Olivia Octopus, X Ray, Serpent and Incredible Hulk.The only stretch figure said to be produced in numbered ,limited quantity. Valuable in almost any condition, These Hulks are as rare as it gets!!! Yes, believe it or not, there are only 12 original Stretch Hulk boxes remaining today. I have 4 in my collection and 2 are signed by Lou Ferrigno the Incredible Hulk himself!Two of my four boxes are almost mint with all sides and flaps.Having the figure is a great thing, but owning the origianl Box is a very important part of its value and completeness.The Boxes are even more rare than the Stretch figure making it a very very unlikely find, especially in mint condition. Just How Rare Is the Denys Stretch Hulk You Ask? Just think about it, Kenner made 40,000 stretch Armstrongs and I have seen maybe 50 come across ebay in the past seven years. The chances are greater you will see more Stretch Armstrongs due to the greater number produced and their repective known to exist ratio.You have a better chance of getting struck by lightning than owning one of these Hulks.Keep in mind that even if you find one the chances of you winning it on ebay are very slim as you will be bidding against many other collectors. Be ready to pay big. With only 19 known to exist, If Denys Fisher made many thousands of these wonderful Hulks, then were the hell are all of them? Surely more than only 19 would have showed up by now in an almost eight year search. The fact is,these Hulks were definitely produced in a much less quantity than the Armstrongs because of the fact that there are only 19 currently known in existence. Also, Kenner produced 40,000 Stretch Armstrongs, Denys Fisher produced only a fraction of the Armstrongs Kenner did,So it would follow that Denys Fisher produced a much smaller quantity of Hulks as well. If we do the math, about 50 Kenner Stretch Armstrongs are currently known out of in fact 40,000. Thats 0.2 % Now if we take the 19 Hulks, we can assume there are also 0.2 % known which would make 10,000 Hulks produced. That being said, theoretically the Hulk is in fact Limited, The fact is, if any one person wanted to obtain one of these Hulks, Where would they find one with only 19 in existence? As I said before, The Hulk is Super Rare. Sold Only Out Of Catalogs! Most of these Stretch Incredible Hulks were sold out of a catalogs back in 1979.The catalogues are said to have been either Kays or Freemans mailorder catalogues.Only a small amount made their debut in some small local UK stores. One of these stores was in fact called Asda Supermarket in Doncaster England. The Hulk had a price tag of only £8.99 which eqates to $17.38 U.S. Maybe out there someone has one they dont even know about from there childhood and its stored up in the attick,or up in a garage loft behind some boxes.If you ever get lucky enough to see one of these Hulks, Do not hesitate, grab it! It will most likely be your only shot at it. No other stretch was said to be numbered and limited in its production. This is the kind of toy that will always be worth a bundle.Just remember, There are Bobbleheads that are worth over $10,000 and they cannot compare to the originallity this toy offers which makes these Hulks and any Stretch figure even more rare and enticing to collectors. It just so happens that there was in fact a $10,000 offer from a Doctor who sold his Hulk for $2,500 and then regreted selling it.The Doctor's $10,000 buy back offer was declined. One of the more recent Hulk sales in jan 2008 achieved over $5,000 and and another Hulk sold in a bulk sale with 4 other stretch figures for almost 10,000! Trust me when I say,these Hulks are few and far between. Anything that exists in a small number a 19 is gona cost ya. But lets forget the monetary value shall we?.This Toy means more to collectors than the money. Just try to buy one from someone and see if Im wrong.No Way Jose' is what they will say if you try to offer any amount of money. I know I woudnt sell my 5 Hulks for any price either.These Hulks are as Valuable and rare as it gets! My friend John says he will literally take his Hulk with him to his grave. Hmm, Not a bad Idea. And they say you cant take it with you. Does your Hulk have the numbered Tape? Is your Hulk Still Soft? Do you have one in the attick? Would you pay big bucks for a Hulk ? Could the number 1 be out there? How bad do you want the Hulk ? DENYS FISHER STRETCH INCREDIBLE HULK, OH BABY! THE RAGING MACHINE OF DESTRUCTION !!!!!!!!!!! 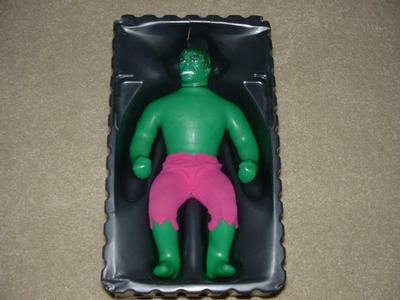 The Denys Fisher Stretch Incredible Hulk was produced and packaged with either the White Styrofoam Coffin and Lid, or the Black Plastic Tray Coffin and small chest cross insert.All the Hulks came with an instruction manual in green print.As the Stretch Armstrongs, the Hulks were sometimes produced with a smoother body or a more cut and defined body.Anyway, all Hulks are created equal. But just to be sure I have both. 3) Styrofoam coffin and lid, or Black Plastic Coffin with matching plastic chest insert. 4) Number Tape showing all numbers On top of box and reading as follows 351/ 1,259. I am aware of one actual purchase offer a fellow collector said he recieved for the below stated amount and this offer was DECLINED. 5) Box Signed by Lou Ferrigno ( The real Incredible Hulk) Will increase its value greatly. I happened to have recently met Lou Ferrigno and he signed 3 of my boxes. These are the Only Stretch Hulk Boxes ever signed by Lou the Hulk himself.Lou does not appear very often which makes his signiture that much harder to ever aquire.His last appearance in my area was way back in 1977. As with any rare item of high value, finding someone willing and with enough money to pay what it is actually worth can take time. Value You ask???? A Totally Mint Hulk with the number tape unopened on original box with coffin and instructions, $10,000 Bucks. A hulk with no number tape but a 8 to c10 original box and everything else $4,000 to $7,000 . Hulk with a Box copy,and everything else original, $3,800 plus. Hulk with no box but original coffin and instructions, $3,200. Just the Stretch Hulk,$3,000 or more depending on its codition.